My friend Shaheen, the Urban Goat Girl rocks! Her recent hobby, which I wholeheartedly applaud and sincerely hope she commercializes is organic, raw milk goat cheese. 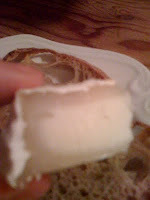 Elusive in this country but oh so delicious is fresh unpasteurized chevre. If this is danger, sign me up! BrixChick Janesta and I enjoyed not only a fabulous Brie, but also several chevres seasoned with lemon rind and pepper, garlic chive and cumin. I won' t mention the artisan bread. Okay, I will! It was halbweis, homemade and perfect! To go with that, what would we pair but Sancerre? I needed to visit Solano Cellars to pick up some wine, so got an awesome recommendation to go with the cheese. At $18.99 it was a treat from the Loire Valley that was as close to the Sancerre I craved as conveniently possible. Delicious! 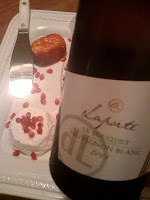 The freshness and brightness of the wine meshed insanely well with the cheese. A very clear, pale yellow, the wine had a nice acidity and a lovely flavor and aroma. Lemon blossom, green leaves on the nose and lovely Sauvvy B charateristics on the palate. It was good on its own, but gr88888t! with the cheese. We thought of our friend @WineInkbyTia whom we knew was traipsing through the Loire, while we contented ourselves with the product of the Loire and of our delightful Urban Goat Girl friend, Shaheen! Look at the paste she got on her brie! Yum! 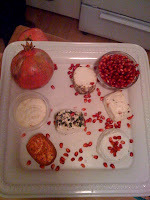 Love goat cheese, in all firmness factors. My wife hates it. Finally something the two of us violently disagree on! Sauv Blanc - great match. I also have tried goal cheese with reds, didn't work for me. Doesn't like goat cheese? Heresy! So funny! A good friend's sister doesn't either, and picked all the goat cheese out of her sister's delicious 3 Cheese Lasagna. However, I would wager that neither of them could resist The Urban Goat Girl's Habanero Spread. It's just that good! Although difficult to pair due to the hotness. We keep trying! Thanks for reading!